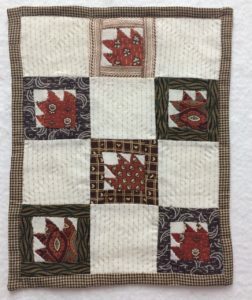 My favorite quilt block is the Bear’s Paw. 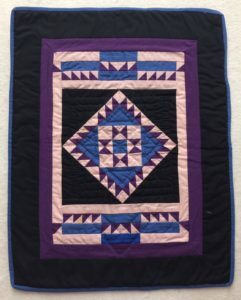 The first quilt I am sharing may just be my favorite miniature quilt in my collection. I purchased it from E-Bay and each little HST is pieced (with 2-3 stitches). It is NOT appliqued or a preprinted piece. It measures just 7.25” x 7.25”. Can you imagine making this?! It also has perfectly mitered corners where the pieced stripes come together. I love the cutouts on the bottom corners, so it fits perfectly over a 4-poster mini doll bed. It was made in 1989 by Maggi-Made Imaginations. The next one is slightly larger (8.5” x 11”) and it features each individual Bear Paw surrounded by a little border and then set together with plain blocks. There is no batting or quilting and the front and back are combined with a knife edge binding rather than traditional. I am not that proficient at dating fabrics, but I would guess this one is over 100 years old based on the designs and feel of the fabrics. It is another favorite. 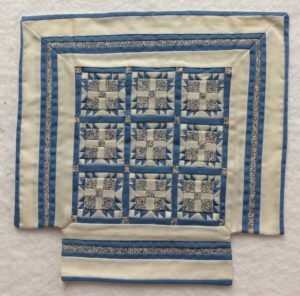 The third quilt (13.5” x 13.75”) is also from E-Bay. Each little Bear Paw HST is only .5” and the little 9-patches in each corner of the sashing are only 1” so it contains a lot of tiny piecing. Unfortunately, the two fabrics are both so busy, even though they are primarily dark and light it is a little difficult to see some of the detail. This green quilt (18” x 18”) was made for me Christmas 2008 by my sweet friend Linda Jackson (she lives in FL now). Her machine quilting is exquisite, and I treasure this little gem. 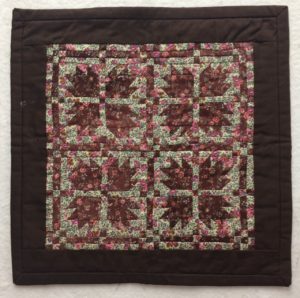 The last quilt (15.25” x 20”) is a variation on the Bear’s Paw. 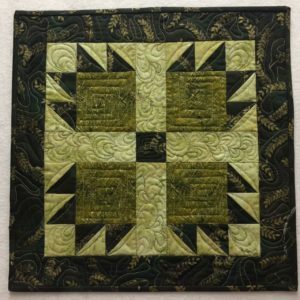 Her label (Kelly Wellits) calls it a Miniature Star Medallion but I sure see my favorite block surrounding the star, don’t you? I hope you have enjoyed my little show of Bear’s Paw quilts. Does it make you want to go to the mountains and make tracks (with fabric) in the woods? I think it might be time to find a spring quilt retreat.